The American Cocker Spaniel is a sweet, affectionate, fun-loving, devoted, trusting, playful, working dog who wants nothing more in the world than to please you. He swings his tail so excitedly when he sees you, his entire body wags! He wants to be with you as much as possible and will stay by your side, like a shadow. He is not a dog who can be left alone for long. He craves human companionship and thrives on family life, and without it will begin to bark, chew, or urinate to show his distress and unhappiness. He is a sensitive dog who needs you, always tries to obey you, and is ready to work for you. He is a trainable, easygoing dog who is respectful of your authority and will rarely challenge it, but he needs gentle and encouraging training methods, as he is a "soft" dog who doesn't respond well to harshness. He needs you to be as happy as he is. He is difficult to housebreak and may urinate when excited or frightened. A warm and friendly companion, he loves people and is very sociable, although he needs to be exposed to lots of people while still young so that he doesn't grow up to be shy or timid. He is a good watchdog and makes a fine, noisy "doorbell," barking loudly to alert you to strangers--but then is much more likely to make friends with the intruders than scare them off! He can sometimes bark too much. He is moderately energetic, requiring a daily leashed walk or other outdoor activity, and chances to romp and play freely. When out walking with him you should avoid deep thickets and brush that can tangle with his coat. He loves to play, especially with his toys, which he may chew to bits or hide in order to trick more out of you. Along with being a joyful, tender family pet, he can be a marvelous sporting dog, a gun dog, and a gentle therapy dog. He usually gets along well with other pets, and loves and responds well to considerate, responsible children. You must be careful not to spoil and overfeed him, and keep an eye out--he loves to steal food!--so that he doesn't become overweight. He may have odorous ears and is prone to ear infections, so you need to clean his ears regularly. He is a medium shedder, and so might not be a good dog if you are concerned about dog hair in the home. 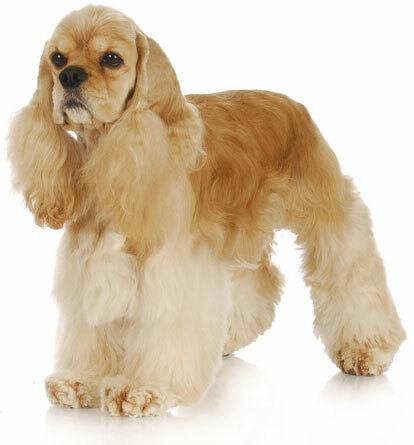 The American Cocker Spaniel is 14 to 15 inches tall (to shoulders) and weighs 18 to 28 pounds. He has a long, flowing, silky, coat. His coat can be solid or have two or three colors, including black, tan, white, brown, gold, red, cream, sable, blue or silver. You need to brush his coat for 10 to 15 min twice a week to keep it free of tangles and mats. The American Cocker Spaniel can be traced back to Spanish dogs of the 14th century used as hunting dogs. "Cocker" comes from the bird he was often used to flush, the "woodcock." The breed was refined and shown in England during the late 1800's, and brought to America where he was developed as a smaller dog. The AKC recognized the Cocker Spaniel in 1878, and by the 1930's the American Cocker Spaniel and the English Cocker Spaniel were separated into two distinct breeds. The American has become an enormously popular dog, with much concern in recent years that he is being over bred, with warnings issued that buyers be careful to locate a puppy with the true, gentle Cocker temperament. His AKC popularity was 17th out of 157 breeds in 2007.